Together with the nearby Carlsbad Caverns, Guadalupe Mountains National Park is far removed from most other natural attractions of the Southwest. The closest cities are El Paso (110 miles) or Carlsbad (55 miles), and there are few facilities in this mostly barren region. 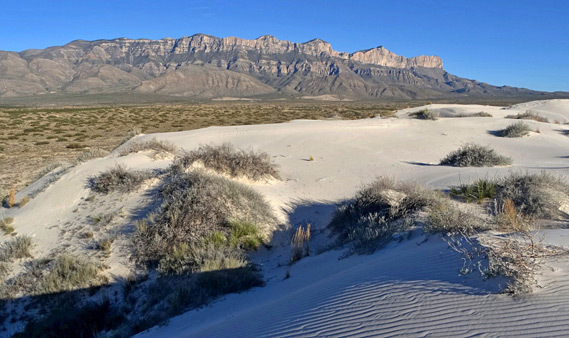 The park contains the southern end of the Guadalupe Mountains, an isolated range surrounded in all directions by the Chihuahuan Desert, and few people visit, due perhaps also to the lack of a central attraction, a scenic drive or named viewpoints. This is primarily a park for hiking; the mountains are crossed by a good network of trails and the region has varied climate zones with differing wildlife and vegetation, interesting geology, and many photographic opportunities. As an added attraction, at the end of summer the red, gold and orange colors of the foliage in some of the canyons create a spectacle as good as that in New England. (see map of the park) The usual approach to the national park is along the relatively well-traveled highway US 62/180, which crosses the southern Guadalupe Mountains foothills. The main entrance, location of the visitor center and campground, has a picturesque setting right beneath high cliffs at the mouth of Pine Springs Canyon, the largest valley through the center of the park. The campground consists of 20 partially-shaded tent sites and a paved parking area for RVs - no hookups, and no facilities apart from rest rooms and picnic tables - but the surroundings are beautiful, and the most popular trails start right from the site. Evenings here can be quite cool since the site is in shadow relatively early, as the sun disappears behind the mountains in late afternoon; the silhouette of the peaks can be seen moving slowly southwards across the desert for several hours after the sun leaves the canyon. There are three other entrances to the park; two side roads lead to McKittrick Canyon towards the east, start point for a long trail through a riparian valley, and to Frijole Ranch, site of a preserved homestead and trailhead for a loop hike to two springs. Seven miles across the mountains, the forested Dog Canyon area at the north side of the national park is also reached by a paved road, but a 105 mile drive through New Mexico is needed to get there. Admission to the park (2019) is good value at just $5 per person, while the campground is also inexpensive, $8 per vehicle per night, though increases are proposed, to $7 and $15 respectively. The Guadalupe Mountains are part of an ancient fossilised reef which also includes the Carlsbad Caverns in New Mexico - a huge limestone formation that continues in a great arc west towards Van Horn and east towards Alpine. 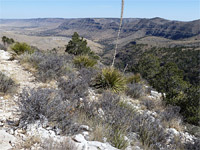 Most is buried, the only other exposed sections being the Apache, Delaware and Glass Mountains, all in Texas. The high country has much exposed rock with fossils, and a climate typical of lands much further north, sustaining pine, fir and aspen trees and creatures such as elk, mountain lions and even black bears. Surrounding the mountains lie the plains of the Chihuahuan Desert, where the temperatures usually top 100°F for over four months of the year, and plant life is quite different - several species of cacti, yucca, sotol and other similar spiky bushes. This land is towards the northern edge of the desert, which in Texas is most spectacular around Big Bend National Park, and continues south far into Mexico. 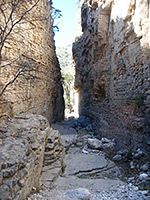 The canyons of the Guadalupe Mountains offer another contrast, with a transition from desert to mountain environments as well as much plant life found nowhere else. Most have streams flowing through at some times of year which support a rich riparian mixture of many kinds of trees, bushes and wildlife. 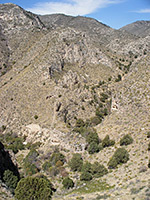 McKittrick is the most popular canyon; other ravines with trails include two forks of Dog Canyon and the lower end of Pine Spring Canyon (Devil's Hall Trail). The national park includes a rarely-visited desert area west of the mountains, at the edge of Salt Basin, a great arc of salt flats, dry lakes and sandy mounds that extends 30 miles north to south. Most of the section within the park is occupied by a broad depression formed by geological faulting, around 3,700 feet in elevation, and once filled with a shallow lake. The waters have long since evaporated as the climate has become drier, and now the most spectacular feature is a band of white gypsum dunes 3 miles in length, the north edge of which is followed by a short trail, starting at the end of Williams Road, an unpaved though regularly maintained route (impassable when wet) that branches off the paved Hwy 1576 from Salt Flat, along US 62/180 - a drive of 48 miles from the park headquarters. The dunes reach a maximum height of 60 feet, and are being gradually enlarged, with salt blown by the prevailing wind. The basin is open for day use only. Descriptions of all trails in the national park. 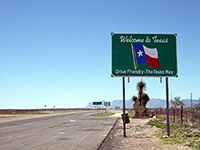 The nearest towns with hotels close to the Guadalupe Mountains are Carlsbad (55 miles), El Paso (110 miles), Van Horn (64 miles) and Whites City (35 miles).